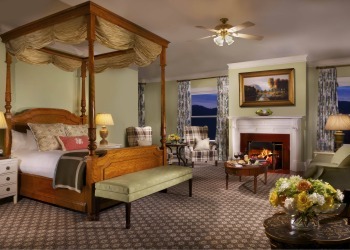 As grand as the history behind it, the Omni Mount Washington Hotel, located in Bretton Woods, New Hampshire, is gracious in ambiance and generous in amenities. A favorite New England retreat of presidents, poets and celebrities, the hotel delights every sense with enchanting music, refined dining and luxurious d�cor. A grand masterpiece of Spanish Renaissance architecture, the Omni Mount Washington Hotel in New Hampshire's White Mountains was a two-year labor of love for 250 master craftsmen. Conceived by industrialist Joseph Stickney, this National Historic Landmark opened in 1902 and has been attracting generations of families ever since. The final phase of a $60 million expansion and renovation has just been completed, including guest rooms, public areas and dining facilities, complementing the recent additions of a signature spa, thrilling year-round canopy tour and renovation to the classic Donald Ross designed Mount Washington golf course. 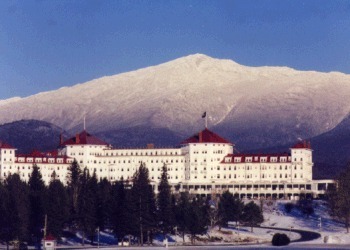 The Omni Mount Washington Hotel is located in Bretton Woods, New Hampshire, only 2 1/2 hours from Boston. Bretton Woods is part of a land grant made in 1772 by Royal Governor John Wentworth. The area was named after Bretton Hall, Wentworth's ancestral home in Yorkshire, England. The superstructure of The Mount Washington Hotel boasted a steel network, uncommon in its day. The Mount Washington Hotel was built by New Hampshire native Joseph Stickney, who made his fortune in coal mining and the Pennsylvania Railroad. Stickney spared no expense in building the imposing hotel. The latest design and construction methods were used. Innovative and complicated heating and plumbing systems were installed. To this day, the Bretton Woods Hotel has its own private telephone system and Post Office. Ground was broken in 1900 and construction was completed in 1902. Two hundred and fifty Italian craftsmen, skilled in masonry and woodworking, were brought to Bretton Woods and housed on the grounds. A new type of power plant served reliably for over 50 years. Imported china, hand-colored postcards and playing cards and a 1917 travel guide -- genteel mementos of an elegant legacy. On July 28, 1902, the front doors of this Grand Hotel opened to the public with a staff of no less than 350. The most luxurious hotel of its day, The Mount Washington catered to wealthy guests from Boston, New York and Philadelphia. The Hotel has been host to countless celebrities, including Thomas Edison, Babe Ruth and three U.S. Presidents. As many as fifty trains a day stopped at Bretton Woods' three railroad stations. One of these stations, Fabyan's, is now one of the Resort's dining establishments. As a part of Italian tradition and superstition, the artisans and laborers who built the Mount Washington Hotel varied the number of steps to the second floor (thirty-three from the registration area and thirty-one in the South Tower) to confuse ghosts in the hotel. The stairs haven�t confused one ghost in particular. 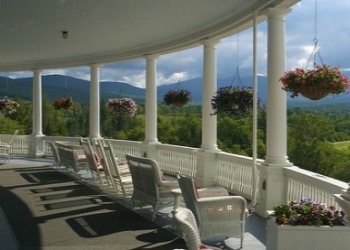 Carolyn Stickney, the widowed bride of the Mount Washington Hotel�s owner, played a principal role in the development of the hotel and visited the hotel season every year. She became known as �the Princess� after marrying French royal, Prince Jean Baptiste Marie de Faucigny Lucinge, and often held extravagant parties in her own private dining room, now called the Princess Lounge. After her death in 1936, caretakers and managers prowling the property during the winter hibernation months reported catching glimpses of the Princess descending the stairs for dinner or lights switching on and off in one of the towers. 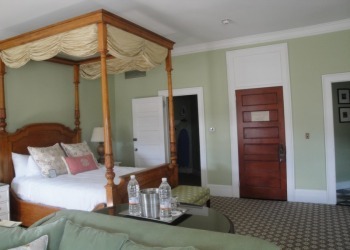 The Princess often returns to a third-floor guest room at the Mount Washington Hotel, where her four poster maple bed still resides. Several guests staying in that room have reported being awakened to find a woman sitting at the end of the bed, brushing her hair. Hotel employees often pose for photos in front of the hotels veranda and one year, employees made a startling discovery in an enhanced photo. When the picture was blown up, viewers could see a woman in the window of the Princess�s room. 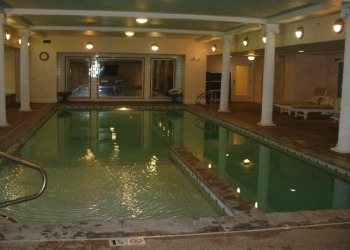 No one had checked into the room and it was said to be vacant.